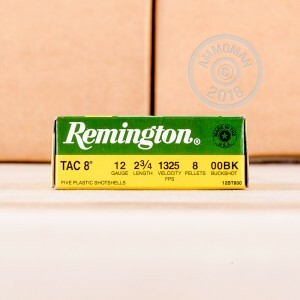 Remington Express Tac 8 shotshells are designed to meet the needs of law enforcement and deliver consistent performance that won't let you down in a self-defense situation. 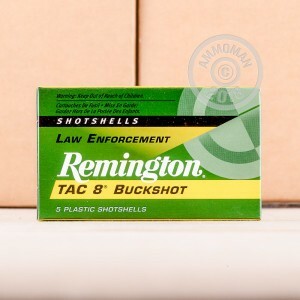 This is a great 00 buck load for your combat shotgun! Each 2-3/4"shell in this box of 5 fires a column of 8 hardened antimony pellets at a muzzle velocity of 1,325 feet per second. 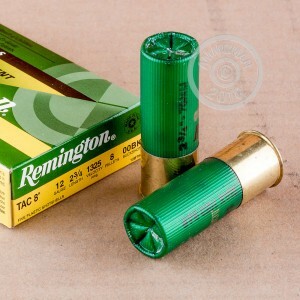 These shells are loaded in Lonoke, Arkansas and use the Power Piston wad. They have sealed primers and mouths for improved water resistance.